Weekly Geeks #11. This week’s theme is about historical fiction. Do you have a favorite book that really pulled you back in time, or perhaps gave you a special interest in that period? Include a link to a review of it on another book blog if you can find one (doesn’t have to be a Weekly Geek participant). At first, I wondered exactly what they meant by historical fiction. Most commonly, historical fiction includes books that take place entirely in a past time period including a mix of real and fictional characters. However, there are newer books that have become popular that mostly take place during the present. Books like Angels & Demons and Da Vinci Code by Dan Brown as well as The Alexandria Link by Steve Berry and many of the Indiana Jones fiction books investigate and examine past historical events, but do it from the present. Many times including passages that take place entirely in the past. I really enjoy reading these newer books because they are usually good adventure tales, but it feels like I’m learning a bit of history too. I would consider this historical fiction, but looking around the net, it doesn’t seem like other people do. I was set to pick one of the above books, but I’ll dig back into my “Books I’ve Read” shelf a bit further for a more traditional historical novel. It takes place in one of my favorite genres that, now that I think about it, I haven’t read in years; the western. I used to love reading books about and that took place in, the Old West. 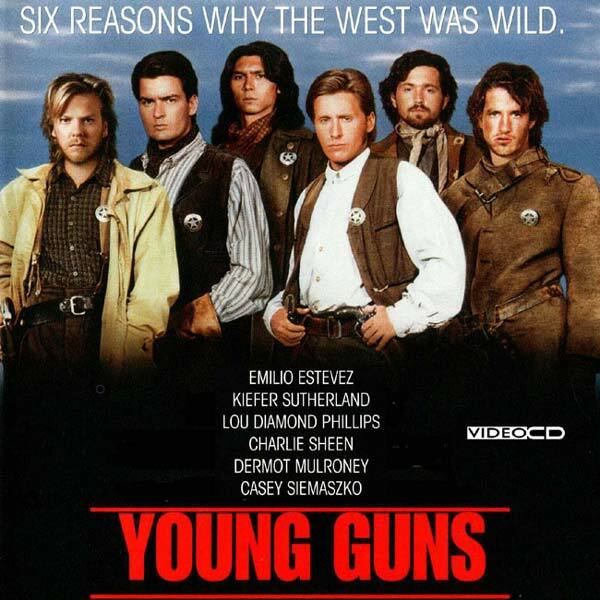 I think what actually got me interested in the Old West was the 1988 movie Young Guns staring Emilio Estevez. More specifically, it got me interested in the history of one William H Bonney, aka Billy the Kid. After seeing the movie I read everything I could get my hands on having to do with gunslingers and the Old West. Many of the books I read told the real history of the west, but I also started reading fiction based on legends of the Old West. There was an old “Garage Sale” store in Birmingham I used to go to in order to search for old and interesting books to read. In fact, this was the same store in which I would purchase my collection of Back to the Future movie novelizations. Inside its musty book room I found a ton of old paperbacks featuring gunfighter stories. Louis L’Amour’s The First Fast Draw, the Cemetery Sam western series, old fiction books about Wild Bill Hickock and Butch Cassidy. I bought them all and devoured them. Especially anything that focused on Billy the Kid, my favorite western gunfighter. Then, while traveling with my family on vacation sometime in 1991 or 1992, I found Anything for Billy by Larry McMurtry in one of those paperback spindles you see in supermarkets by the magazines. The copy on the left is actually a new printing of the book. The copy I found oh so many years ago, and I think I still have somewhere, is on the right. I saw this paperback, immediately noticed it was a western and read the back. As soon as I found out it was loosely based on Billy the Kid, I bought it and started reading. And I loved every page of the story. The book is really good. A dreamy, historical re-invention of Billy the Kid as told by a fictional newspaper reporter who travels to the West to learn about the famous gunfighter. What makes the book great, and stand out from other western novels, is the fact that it’s told in the real world. In too many western novels the hero is almost supernaturally good at being a gunfighter. The stories are almost unrealistic, some of the lazier ones making the hero into a gunfighter version of James Bond; unbelievably lucky, unable to be killed and always gets the girl. With Billy, McMurtry paints his character of Billy Bone in very realistic strokes. Showing him to be an immature, confused young man who is just trying to survive in one of the roughest and toughest places in American history. The story is immensely satisfying and now that I’m talking about it, I may have to go back and read it. It’s really that good. The book was originally published in 1988 (wow, the same year as Young Guns…spooky) but the paperback I picked up in the supermarket was released in 1991, which, like I said, is about when I read it. Interesting side note, my wife is from New Mexico, where Billy lived most of his life and finally died. At some point, I really need to make a trip to Lincoln County (my wife went when she was younger) to visit the historical places having to do with my favorite gunfighter, Billy the Kid. This entry was posted on March 26, 2009 at 9:12 am and is filed under Billy the Kid, books, pop culture, reviews, Weekly Geeks with tags Billy the Kid, Book Report, book review, movies, Weekly Geeks. You can follow any responses to this entry through the RSS 2.0 feed. You can leave a response, or trackback from your own site. Interesting post, and I really liked your pictures! I think these ´wanted´ posters appeal to us all. Thank you for stopping by, Dorte. And thanks for agreeing with me that some of the newer books were, in fact, historical fiction. I’ve never really read Westerns, but that Anything for Billy looks extremely good. It was very good, Maree. It’s definitely a western, but not really a “shoot ’em up” type western. It’s more a character study of Billy the Kid, but there are some action scenes in it. I don’t really have a favorite historical fiction setting or person (well, except Anne Boleyn when I was younger) but yours is interesting! I know who Billy the Kid is of course but I don’t think I’ve read HF with him in it before. Anything for Billy sounds like a good story though! Wow, thank you so much for this post. My husband and I are trying to find something our Western-loving father-in-law/father hasn’t read already. Your write-up was extremely helpful. Awesome! Glad I could help, Sarah. I hope he enjoys it as much as I have. Now this is a great post on fiction.